Market Monetarists make a big deal about automatic offsetting of fiscal easing by independent central banks with Inflation Targets. There has been a lot of debate about it but not much agreement. I have tried to simplify the picture through this diagram. The quadrants represent the four combinations of monetary and fiscal policy. There is widespread and justified fear of the top left quadrant, easy monetary and fiscal policy. It hardly ever ends well. The most extreme case being Germany in 1923 but there are many modern examples. The minor regional spat in the UK over Corbynomics and Peoples’ Quantitative Easing (PQE) shows that the idea of government’s taking control of monetary policy and just printing to pay for spending is still seductively attractive. It will produce higher inflation and higher nominal GDP, but results in a collapse of RGDP as entrepreneurs and wealth flee the country. It would also make accusations that recent conventional QE results in some winners and some losers seem trite, and it is in fact not true. Whereas governments who hyperinflate always reward favoured special interest groups with new money first. Ironically or, rather, tragically, Greece has long had a very famous tradition of paying the army first and police with new funds. The rule still persists today as the end-result of hyperinflation is so often a breakdown of law and order so the government needs to protect itself above all else. 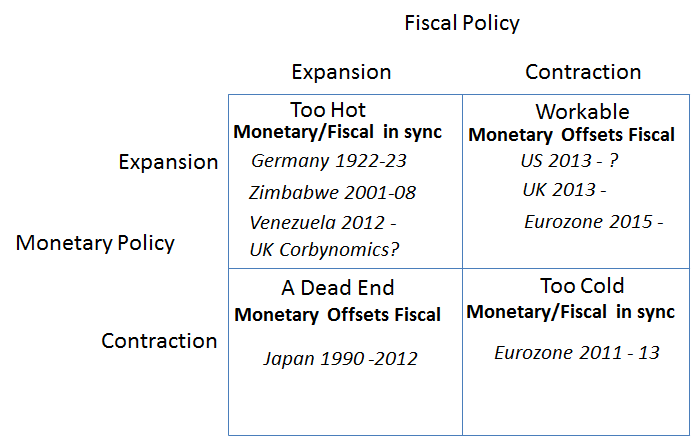 It is hard to believe that any country would voluntarily put itself in the lower right quadrant of having both contractionary monetary and fiscal policy. However, the EuroZone as a whole in 2008 and more seriously in 2011 was firmly in this horrible position. There was one rate rise in 2008 in the midst of collapsing economic expectations and constant calls for fiscal discipline. There were even two rate rises in 2011 in the midst of quite serious reductions in fiscal spending or technically speaking, cyclically adjusted primary balances (CAPB). Why did they do this? The still largely experimental monetary union of the EuroZone has too many chefs and too diverse a set of economies. Fortunately, this is all water under the bridge now,and policy seems set much better now under Draghi and the current QE. It will still be a painfully slow recovery as in the US because of the Inflation Target Trap (ITT),but it is better than not doing QE. It is also hard to believe any country or currency bloc would voluntarily go into the lower left quadrant, with a fiscal policy set for expansion but a monetary policy set for contraction. Again, we see it too often, This is the classic monetary offset of Scott Sumner whereby fiscal expansion is deliberately sabotaged, or just unconsciously sabotaged, by central banks with inflation targets. Expansionary fiscal policy shifts demand curves to the right but contractionary monetary policy shifts it back down again. Independent central banks do it actively, or in their sleep, or markets think they will and so it happens. Bizarre, but true. 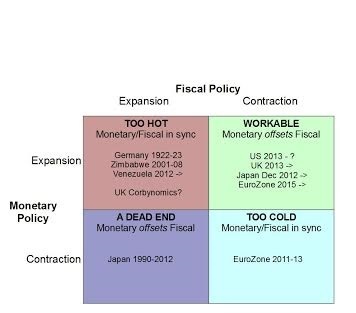 The upper right quadrant is by far the least bad of the four as monetary policy demonstrably offsets contractionary fiscal policy, if such a policy has been decided upon by the politicians. It’s not great but an acceptable way out of recession, once the initial shock is over. Better, of course, not to have the recession in the first place. Not on the quadrant is the best situation, akin to the Great Moderation, where the real economy grows at a reasonable pace and the central bank maintains stable nominal growth too. A mythical section that many Keynesians flirt is one where monetary policy is powerless to be expansionary. The famous Zero Lower Bound. QE and now negative interest rates have demonstrated that in practical terms monetary policy is never out of ammo. Too often central banks are out of the will to use the ammo at their disposal – trapped by Inflation Targets,and Inflation Targets morphing into Inflation Ceilings. A common criticism comes from Keynesians who suggest darkly that Market Monetarists actually don’t approve of fiscal easing at all. But that is a separate question where there is a range of views. Scott Sumner has made it clear that he thinks fiscal easing via tax cuts, particularly employer payroll taxes, is preferable to additional spending. Some Keynesians agree with this too (eg Ralph Musgrave here). I tend to agree with Sumner because I, like most of those in financial markets, do not regard the government as particularly effective at spending. There are few empirical studies, but plenty of anecdotal evidence, that governments find it hard to deliver large projects, on time, on cost or even at all. Governments find it hard to “pick winners”, and usually just get captured by fast-talking charlatans. Increased spending on the two biggest areas, education and health, may have benefits but there are many arguments about how that extra spending has a multiplier above one, even in the absence of monetary offseet. Fears centre around “capture” of additional resources by various internal interest groups without any additional output. “Value for money” being the issue as good cost/benefit analysis is rarely undertaken. Increased spending on welfare, ie government transfers, obviously does not boost GDP as it not part of GDP. To be balanced, the evidence seems to be that tax unfunded, employee-side or business, tax cuts doesn’t lead to a lot of extra growth. Whether that is due to monetary offset coming into play or because the supply side benefits not coming through is unclear. This entry was tagged Fical and Monetary policy, James Alexander, Scott Sumner. Bookmark the permalink.